AN EVENING OF CREATIVE MUSIC. Please, join us for a special evening at ArtYard’s theater on Saturday, Nov 11th at 8:00 PM. Enjoy a concert featuring Karl Berger (vibes and piano), Ingrid Sertso (vocals), Mark Helias (bass) and Billy Martin (drums and percussion). The second set will feature Karl Berger conducting an ensemble of improvisers from his Music Mind workshop in a spontaneous composition. 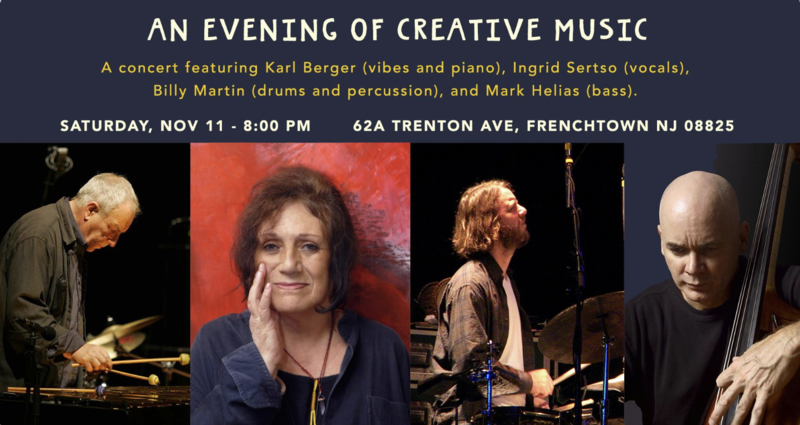 Karl Berger and Ingrid Sertso (founders of Woodstock’s legendary Creative Music Studios), Billy Martin (of Medeski, Martin and Wood Trio) and Mark Elias (Open Loose improvisers trio).